Tied by Bill Brothers for our Uni-Products Fly Swap. 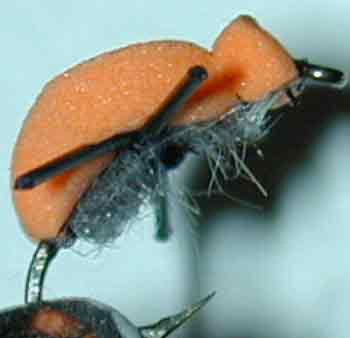 This fly was tied in response to the fish repeatedly hitting my bright foam strike indicator. It can be fished alone or with a nymph or ant dropper. 1. Cut a strip of foam approximately 1 1/2 times the hook gap from the foam sheet. 2. At one end of the strip, cut a 'V' shape in the foam. Clip from the center of the foam outward, so there is a distinct point. 3. Attach thread to hook at the bend. Tie in the foam at the point of the 'V'. 4. Dub the body to just below the hook eye. Wrap the thread back down to the middle of the shank. 5. Tie in the strands of snow brush. Separate the strands to form a X with a few turns of thread. Wrap the thread to just below the hook eye. 6. Bend the foam over the hook and tie in. Tie off thread and clip. 7. Snip the foam at the hook eye. Trim the foam in front of the wraps to form a neat head. 8. Add head cement to the front and back of fly.